This was a exciting process and after much deliberation, I would like to quote the great poet Jimmy Buffett and take my chances "Trying to Reason with Hurricane Season"
He added, "Let's Go #Heat!!!!!" On the bright side, the Buffett quote is good for the Heat haters, who desperately needed a new variation on the "taking my talents" meme. But it's also very, very good for the Heat, who are now somehow more terrifyingly loaded than they were last season, when they advanced to Game 6 of the NBA finals. Miami might now have the truest "Big 4" in the league. 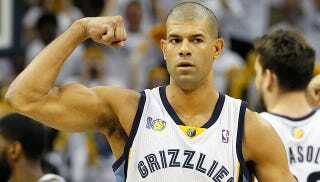 We'll update once the terms of the deal are released, but it seems likely that Battier will be taking a pay cut, as well.